[Jesus said,] "For God is Spirit, so those who worship him must worship in spirit and in truth." 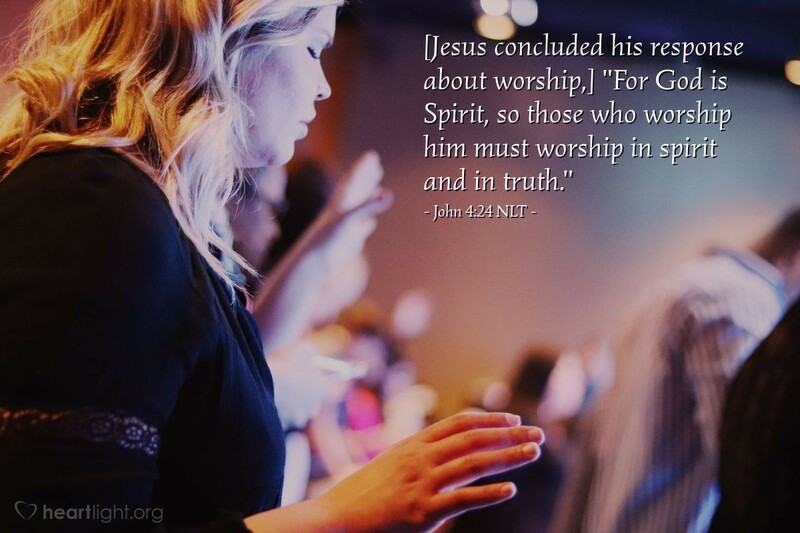 One of the truly remarkable truths that Jesus teaches us is that worship is spirit to Spirit. God is Spirit, and we are given his Spirit when we are born from above (see Titus 3:3-7). We worship spirit to Spirit — our spirit, sanctified by the Holy Spirit within us, to God who is Spirit. We have access to God through the Holy Spirit. As we come to God authentically, seeking him in truth, the Spirit of God enables us to worship God fully. He has given us his Spirit so we can be holy and worship him fully. Holy Father, I come to you knowing that I can approach you with boldness through the Holy Spirit. Thank you for providing this gift of access so that I can come to you in holiness and truth. In Jesus' name, I praise you. Amen.